In the land of climatic extremes, of fire and ice, there is a place of unending sun, even in the winter… as the bright eyes of our little children sparkle and shine, even brighter than our brother sun. In 1977, members of Ananda Marga in Reykjavik, the capitol of Iceland, opened the first Ananda Marga School in Europe. The school was given the name “Leikskólinn Sælukot” (A play school in a cottage of bliss). A few years later Didi Ananda Sukriti arrived to run the school. Didi, the “little orange nun” played a very active role in the community of Reykjavik. Our current head teacher has childhood memories of seeing Didi Ananda Sukriti dotting here and there around in town. In addition to Didi’s work at the school she was also well remembered as “the orange nun who gave us free soup.” The teenagers used to hang out downtown and Didi liked to cook for them. It was her positive relationships with the local members of Ananda Marga, parents, teachers, community and many social dignitaries that enabled her to establish Sælukot. The former Prime Minster, David Olson, and the president Vigdis played a major role in getting the land and permission for the school. Much credit is also due to sister Anasuya who was a young university student at the time and put all her energy into establishing Sælukot.In 1995 Didi Ananda Tapatii came to Iceland. Her great care of the project and immense love for the parents and children helped Sælukot to remain well respected in Iceland for its innovative children’s program. Due to its popularity and waiting list Didi took the determination to extend the school. 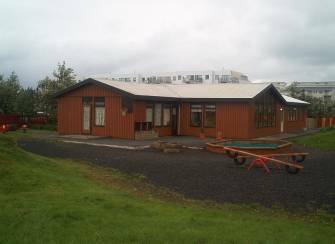 In 2001 Sælukot had grown to include a small summer greenhouse, a very large classroom, one new bathroom, two small rooms, a sports room, parking area, new fencing, private garden, and new play ground equipment.Being posted in a school with a history as old as me is fascinating. I meet former graduates, now adults, and teachers in our school, and parents… and I see in this place, how Shrii PR Sarkar’s teachings have touched and shaped their lives. As educators we often don’t see the immediate effect of our work in the society, but here, I see flashes of that light: Not long ago there was some publicity about a group of children from our school who organised a service project at the children’s hospital. They took their old toys and things and sold them at the supermarket then gave the money to the children’s hospital; they were around 8 or 9 years old, and all graduates of Sælukot. Sælukot is located near the sea, next to a primary school gardening project, an Elderly Care centre and a small local airport. The setting is big and fresh and great fun. On our land we have a tunnel, teeter-totter, sandbox, swings, climbing structures, outdoor vegetable and flower gardens as well as a few small hills that make for great sledding in the winter! Because of our location we are able to take regular visits to the sea and visit the elderly. Iceland is a great place to raise children. With its clean water, air, and safety they can run and play very freely. I was astounded that even during blizzards the children go out to play. Their mothers say that it is due to the fact that when they are babies they wrap them up well and let them sleep in their buggies outside on the doorstep! Inspired by the classroom design of the NHE School in Den Bosch, we have just finished rearranging our classrooms with a separate classroom for each layer of the mind plus two additions, an eco-green house and a music room. 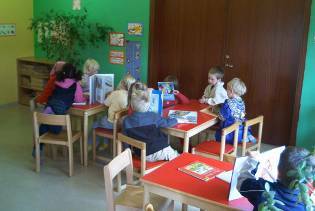 It is wonderful to see how the arrangement of the rooms affects the flow and movement of the children so much. Our staff is currently very busy working on developing an in depth curriculum. In May the school will be celebrating its 28th birthday. One of the projects that we have been working on is a documentary film. This has entailed much research mainly from photos and interviews. 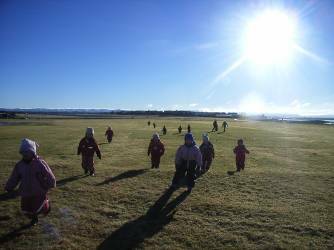 Every former student that I have interviewed, when I ask the question, “what do you remember from Sælukot?” says, “Didi, and circle, meditation, and home.”The children sing kiirtan and meditate twice a day. During free time, we find them organizing their own circle with each other and with the dolls and stuffed animals. There are a few who have their own spiritual stories. Tómas, now five years old ever insists that the spiritual teacher, Baba, is not dead. He will argue with Stora Didi (Didi Ananda Tapatii). When he sees Baba’s photo he says…”He is not dead, I saw him digging in the sandbox.” Tómas saw him two years ago, yet still cannot forget that memory. Yesterday one of the children asked me, “Didi, did Baba eat animals?” I asked, “What do you think?” He replied, “No, I don’t think Baba could hurt anything.” The children’s contact with Baba is merely through a photo. We don’t discuss Baba, and still, they understand. Sælukot continues to be popular among the progressively minded people. Most of the parents are working in the fields of art, music, education and social work. 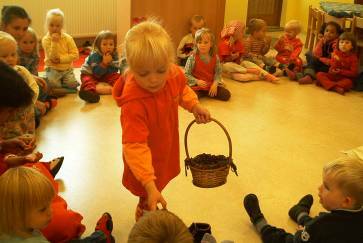 More and more people, when hearing about the specialties of our school, especially the yoga and meditation, mention that in the future, “All schools should teach this.” And perhaps, very soon, that will be a reality of the future. In honor of the 28th anniversary all of our permanent teachers attended the international Neohumanist Teachers Training in Den Bosch, Holland. It was fantastic and really brought a great flow bound to benefit all. In the month of May, on the full moon, we will be having a festival to celebrate the school’s birthday, and will be inviting all the former students, parents, and teachers. Before that we intend to set up a website and produce a DVD about the history of Sælukot.